Thunk! Thunk! Thunk! Left jab. Overhand Rattling left hook. "Take that, you big, ugly, no-talent, go-cry-home-to-Mama ... bag!" Whether it's dressed up as box-aerobics, cardiobox, slug-mania or one of a dozen other names, the sport of boxing has become a heavyweight in the fitness world. You can now find boxing classes, or some offshoot, in 21 percent of all U.S. health clubs, according to the American Council on Exercise. And that figure is rising. To discover what all the fuss is about, I went mano-a-mano with 100-bags for one week and learned what so many others before me have already discovered: Boxing delivers a peerless total-body workout--which you don't need to attend a class to get. Moreover, a boxing-based workout offers you an opportunity to develop real-life skills during a cardio session, to learn the sweet science that many men think they should know, something that buoys their sense of their own manhood. For others (okay, for me), it's a chance to unleash their inner Ali, to trash-talk the hapless heavy bag with jabs like "You dumb gorilla!" or the Sonny Liston-inspired "I'll beat you so bad, you'll need a shoehorn to put your hat on!" In fact, as home workouts go, I'd say that boxing might just be The Greatest. First, find an instructor with genuine boxing experience and take a couple of days to learn the basics--jab, straight right, hook, footwork, etc.--either through private lessons or a small class (as low as $15 a session). Barring that, see the "Technique" sidebar (page 108) for a quick primer on boxing basics; sooner or later, though, you'll want to invest in a lesson to see how you're progressing and to stay motivated. Next, clear a space in your apartment, basement or garage (under a strong rafter) for a heavy bag and other gear itemized in the "Equipment" sidebar (below). And be sure to follow a good boxing-workout regimen, such as the one outlined here (opposite page). I took my lessons from former professional welterweight fighter Steve Petramale, owner of Shadow Boxing, a hard-core Hollywood boxing studio with its own roped ring. Petramale is a purist who cringes at the term box-aerobics; he teaches "boxing class." And he does everything by the book--the way pro boxers do. Petramale stresses the importance of the number three. Three-minute rounds on the heavy bag, to simulate a boxing match. Three rounds of hitting the bag, which, Petramale says, is "as much punishment as you can take without compromising form." Plus, everything you do, from shadowboxing to jumping rope, from sit-ups to stretching, do for three minutes. In between each three-minute burst, there's one minute of rest. Real rest. "You don't see a boxer jogging in place during rounds, do you?" says Petramale, not waiting for an answer. "He's sitting in his corner, resting, getting a drink, because he wants to be at his best when he goes back out. And how can he do that when he's out of breath?" Granted, most people don't go to a cardiobox class to rest; some instructors have their students sprint and do push-ups during breaks from flailing at the bag. And I do mean flailing; the emphasis appears to be on speed--in other words, quantity, not quality. It's a grueling cardio workout, but it may as well be Spinning. Remember: The objective here is to get a workout and hone your newfound boxing skills. If you must jog as you rest, take it easy. The workout schedule (page 111) sticks to the "three minutes on, one off' rule, and gives you a choice of a short (31-minute) or long (48-minute) version. All ab work or push-ups are done after a round of boxing; done earlier, they'll tighten muscles and compromise form, says Petramale. If you're superfit and desire a longer workout, just add more jump-roping at the start and more push-ups at the end. One more thing: Don't worry if you initially float like driftwood and sting like a gnat. According to Petramale, if you take a lesson and follow up two or three times, the butterfly and the bee will emerge within two weeks. To maximize your time on the bag, learn the fundamentals. Keep your hands up in front of your mouth and chin, with the lead hand about six to eight inches ahead of the rear. Tucking the elbows in protects your ribs and recruits your hips into your punches for more power. The rear elbow should rest near your ribs. How will you know you're doing it right? When you can, use your lead-hand knuckles as a "sight." Properly thrown punches snap straight out from the chin, then retract straight back. This provides maximum power and minimizes the time your fist leaves your chin unguarded. If you're throwing quality punches, the bag should not sway wildly when hit. "If you snap the punch," says Petramale, "you fee[ a solid thud and see the bag shudder." 3a Jab: Fire your fist out on a straight line like a bullet, twisting your thumb inward at full extension. Don't shift your body balance forward or move either foot forward; doing so restricts power. 3b Rear straight/ cross: Starting with your rear fist almost touching your chin, and your elbow tucked into your ribs, explode your arm straight out. Trying to keep your back leg straight, pivot on the ball of your foot and rotate your hip as far forward as possible. The punch will be longer, stronger, faster. 3c Lead hook: Your fist starts in the same place as with a normal jab. But instead of keeping your elbow angled down, pivot it outward so your forearm is parallel to the ground. Then snap your hip so that your upper body twists and your punch slams sideways into an imaginary cheekbone. Don't dismiss this old-school training method. If your technique is off when you perform in front of a mirror--where you can watch yourself--it won't be correct when you're on the heavy bag or in the ring. "Shadowboxing is like watching a videotape of yourself and self-correcting," says former boxer Steve Petramale. "It's a great way to study and improve your form." In your boxer's stance, practice moving in all directions: forward, back and side-to-side. Next, incorporate some jabs with your steps, Throw your jab as you step forward with your lead leg. Shadowbox in slow motion to isolate troublesome combinations. 1) Be your own trainer. Watch yourself in the mirror to correct stance, hand position, punching mechanics, footwork. 2) Stick and move around an imaginary opponent. Don't punch hard; you can't knock out the air. One minute: Work on individual jab, hook and uppercut. Next two minutes: Throw combinations. 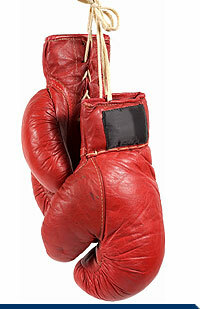 * Boxing: Round 2--heavy bag, 3 minutes Pick up the pace. All combinations: double jab; triple jab; 1-2 (left, right); 1-2-3 (left-right, left hook to chin). * Boxing: Round 3--heavy bag, 3 minutes All combinations; vary placement. Example: jab to chin, right to body; jab to body, right to chin; right to body; jab to chin, hook to chin; 1-2-3 jab to chin, right to body, hook to chin. * Shadowboxing, 3 minutes. Cool down. Work the jab. Shoulder/lat stretch: Put arm across chest, then push it toward the center with opposite hand on elbow. Triceps stretch: Put hand over shoulder and push elbow down with opposite hand. Hamstring stretch: Bend at waist; touch floor with palms. * Abs/push-ups, 3 minutes Alternate the two. Use the following three abdominal exercises. 1. Crunch: With knees bent 90 degrees and feet flat, curl your sternum toward your pelvis..
3. Jackknife: Raise hands from chest to straight-legged, airborne feet. Push-ups: Alternate hand width each set. Do each set to failure. * End: Go home! Oh, yeah. You are home.